ERBIL, Iraq -- The threat of political chaos looms over the imminent defeat of the Islamic State of Iraq and the Levant in Mosul, fuelling fear of a dramatically different -- and deadly -- use for Canada's military support for Kurdish peshmerga forces. Much of the potential upheaval revolves around whether Iraq's disparate Sunni and Shia populations can finally set aside their differences and come together in some sort of reconciliation. But many are also watching to see whether the Kurds plan to demand independence from the rest of Iraq, as their leaders -- whose arguments for separation echo Canada's own sovereigntist movement -- have promised. The Kurds have already made it clear they are ready to fight for so-called "disputed territory" that the peshmerga have liberated from ISIS, but whose ownership is claimed by both Baghdad and Erbil. All of which sets up potentially awkward questions for Canada and the federal government, which has thus far said little about the potential long-term effects of its mission to wipe out ISIS. The Kurds in northern Iraq have enjoyed a degree of self-rule since 1991, when the West established no-fly zones to stop a bloody campaign by Saddam Hussein's forces that killed thousands, mostly civilians. That de facto autonomy became official after the U.S.-led invasion of Iraq in 2003, which saw a new constitution enshrine the Kurds' right to self-government within a unified Iraq. But persistent tensions appear ready to come to a head as Kurdish president Masoud Barzani has promised a referendum on independence once ISIL is defeated. The Kurdistan regional government's top diplomat, Falah Mustafa, says the time has come for an "amicable divorce" from the rest of Iraq. "The One Iraq policy is wrong," he said last week in an exclusive interview with The Canadian Press. "You tried it, it failed. Don't insist on repeating a failed experience. We can't live together within the same country. But we may be good neighbours." Mustafa said the Kurds have fulfilled their obligations in the constitution by remaining part of Iraq, but the central government in Baghdad has not fulfilled its part of the bargain by suspending budget transfers. The money, which is supposed to account for 17 per cent of the national budget, has been held up despite the fact the Kurds have been fighting ISIL and hosting millions of refugees. "We're supposed to be Iraqis and we are asked to be Iraqis, but at the same time we do not benefit from being Iraqi," he said. The central government has said the payments were suspended because the Kurds broke a promise to sell their oil through Baghdad. The differences between Kurds and the rest of Iraq go beyond money, Mustafa said. "We have our own language, history, culture, music, geography, which is different from that of Arabs," he said, before citing several examples of perceived slights by recent Iraqi leaders toward the Kurds. None of which includes the pain and suffering Kurds experienced under Hussein's "scorched-earth policy," the effects of which Mustafa said continue to be felt today. Many Kurds are in favour of statehood at some point, but some worry that the foundations for a successful state -- including a strong economy and an end to corruption -- have not been laid. "Once we are economically, financially and politically independent, only then will we be truly independent," Kara Alsarraj said between sips of tea at a popular shop in the shadow of Erbil's world-famous citadel. One Western official, speaking on background because of the need to work with both sides, said the future of Iraq rests with whether the Kurds press for independence or not. "Question No. 1 is: Does everyone agree that Iraq should hold together?" the official said. "Because if you don't agree that it should hold together, you're not going to reconcile. And that's all about the Kurds. Are the Kurds in or are the Kurds out?" Mustafa insists any push for independence will be peacefully negotiated with Baghdad. But he adds: "We have been free from Iraq since 1991. We defied Saddam Hussein." While the question of independence may remain rhetorical for the moment, the issue of what will happen to the disputed territories is a powder keg waiting to explode. The Iraqi military abandoned much of the territory, including the oil-rich city of Kirkuk and the rocky plains to the east and north of Mosul, to ISIS in the summer of 2014, before the peshmerga freed it all last fall. Driving those plains last week, the peshmerga remained in force, with guard posts and bunkers dotting a new dirt berm that Kurdish officials say is 1,000 kilometres long and marks the extent of their territory. Among the communities encompassed by the dirt wall is the ruined town of Bashiqa. Destroyed buildings, bomb craters and the desiccated bodies of two ISIL fighters stand as a stark reminder of the fierce fighting that occurred here last October and November. Sitting inside a makeshift headquarters on the edge of town, the local commander, Brig.-Gen. Bahrim Yessin, recalled how Canadian special forces trained his troops before the battle for Bashiqa. They then called in airstrikes and provide up-to-date intelligence during the actual fighting. Yessin acknowledged Bashiqa and the surrounding fields are technically disputed territory. But when asked if he thought it belonged to Iraq or Kurdistan, Yessin said through a translator: "Without any hesitation, this area is Kurdish." That view is echoed all the way up to the president, who has said the peshmerga will not give up any territory that they have fought and died for against ISIL. Global Affairs Canada warned Prime Minister Justin Trudeau in November 2015 about the potential long-term consequences of supporting the Kurds. "Should the (ISIS) threat recede," the officials said in a briefing note, "Baghdad will have to contend with a range of land disputes with the (Kurdish regional government), as well as strengthened Iraqi Kurdish forces, which have received training and equipment from coalition members, including Canada." Three months later, the Liberal government announced it would triple the number of Canadian military trainers in northern Iraq and provide weapons to the Kurds. While Baghdad has said little about the disputed territories, a number of militia groups ostensibly formed to fight ISIL have already clashed with the Kurds. The Kurds, meanwhile, want the central government to enact a section of the constitution that calls for local referendums to decide whether the land is Iraqi or Kurdish. 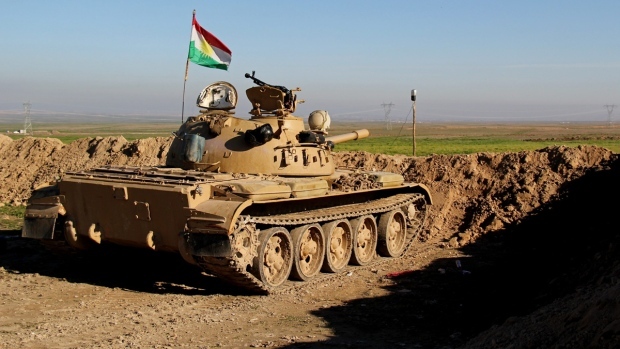 Human rights groups have accused the peshmerga of destroying non-Kurdish villages and refusing to let non-Kurds displaced by fighting return to their homes. The Kurds fiercely deny the charges. Back at his headquarters in Bashiqa, Yessin said he hopes ownership of the disputed territories will be resolved peacefully, "but if the Iraqi military or anyone else wants it, we will not let it happen." Canadian officials have repeatedly noted that with the Iraqi military in disarray, there were no other reliable partners for fighting ISIL when it was capturing large swaths of territory in 2014. Even now, they highlight the good co-operation between all the different factions in the fight, and reiterate the importance of all factions staying united against a threat that's not disappearing any time soon. Brig.-Gen. David Anderson, who is leading a multinational team of military advisers posted inside the Iraqi defence ministry in Baghdad, acknowledged the political situation is "squishy." "Do I think there's the potential for friction? Absolutely," he said. "But right now, everyone is saying all of the right things."